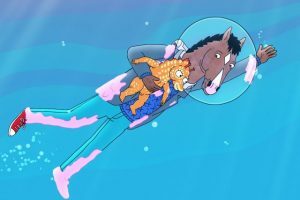 BoJack Horseman makes it to number one! The year’s best episode of television was a stand-alone escape from harsh reality that proved reality always finds its way to catch you. BoJack (Will Arnett), the protagonist of this animated series, is a Hollywood actor forced to go to an undersea film festival to promote a film he’s lost enthusiasm for. Underwater, his inability to communicate with anyone is made literal—the episode, thanks to his restricting diving helmet, is practically a silent film—and attempts at forming a nonverbal connection with abandoned seahorse babies he rescues is only a temporary distraction. This episode is dazzlingly beautiful and among the most creative single episodes of TV in memory; it’s also a perceptive and painful look at being forced to confront one’s regrets.